Memberships 2019: Join Docomomo Australia! Join Docomomo Australia now for the year 2019 to participate in the local and international effort to discover, document and conserve architectural and landscaped sites of the Modern Movement across the 20th century in Australia and worldwide. Docomomo Australia is a volunteer group of architects, historians, conservationists and enthusiasts who all share a desire to raise awareness, appreciation and protection of Australia’s recent designed past for the present and future. Without a strong core of financial members, Docomomo Australia cannot pursue and grow its documentation and advocacy work or continue to be recognised as a voting international working party. With the financial assistance from membership fees we can continue to build our activities and digital forum. Membership is on a calendar year basis starting from 5th October 2018 until 30th September 2019. 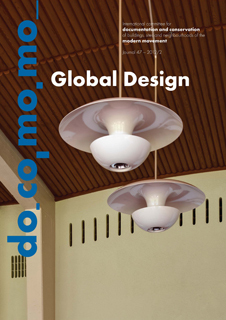 Please pay your 2019 subscriptions by 30th December 2018 to ensure that you receive the two issues of the DOCOMOMO International magazines in 2019, and if an International member you receive your membership card at the beginning of 2019.
document and conserve architectural and landscaped sites of the Modern Movement across the 20th century in Australia and worldwide. Without a strong core of financial members, DOCOMOMO Australia cannot pursue and grow its documentation of the Modern Movement . With the financial assistance from membership fees we can continue to build our activities and digital forum. 1 personal DOCOMOMO MEMBER CARD with discounts accessing partners places and events all over the world. • Villa Tugenhadt [Czech Republic]: Free entrance. • Rose Seidler House [Sydney/Australia] : reduced ticket. • Museum of Estonian Architecture [Estonia]: 10% discount in the bookshop. • Alvar Aalto Museum [Finland]: Free entrance and 15% discount in the museum shop. • Keski-Suomen Museo [Finland]: Free entrance. • Muuratsalo Experimental House [Finland]: 15% off on guided tours. • Studio Aalto [Finland]: 15% off on guided tours and 15% discount in the museum shop. • The Aalto House [Finland]: 15% off on guided tours and 15% discount in the museum shop. • Villa Kokkonen [Finland]: Reduced ticket (9,50€) on their two guided tours: Listen to the Architecture and Connecting Alvar Aalto and Jean Sibelius. • Villa Noailles [France]: 30% off in publications. • Fondazione Franco Albini [Italy]: 20% off on guided tours. • CIALP [Portugal]: Free activities. • Lisbon Architecture Triennale [Portugal]: Free activities. • Museum of Yugoslav History [Serbia]: Free entrance to the museum and reduced fee to their conferences. • Museum of Architecture and Design [Slovenia]: 10% discount on MAO publications. 10% off on all MAO events tickets. • Maison Blanche [Switzerland]: Reduced fee for docomomo International members: 7 CHF. • Schweizeriches Architecture Museum [Switzerland]: Reduced ticket (8CHF) and 30% off the price of special events. • Van Schijndel House [The Netherlands]: 50% off the regular ticket and 10% discount in the English or Dutch edition of the book Van Schijndel House. • Museum of Architecture [UK]: Priority for MoA programming and events. • Canadian Centre for Architecture [Canada]: Free admission to the exhibitions, 10% discount on all purchase at the CCA bookshop, 25% discount on all CCA publications and invitations to all official public openings. • Historic New England – Gropius House [US]: 50% off the regular ticket. • Liljestrand House [US]: 20% discount on suggested rate for Tour of Architect Vladimir Ossipoff’s Liljestrand House. • MAK Center for Art and Architecture at the Schindler House [US]: 50% off price general admission for Doco-momo card holders and $10 discount on MAK Center First Fridays, only for docomomo card holders paying to visit all three MAK Center houses ($50 fee reduced to $40). • Manitoga House [US]: Extension of their Basic Manitoga Membership discounts: unlimited free access to trails, membership discount for House Studio and Landscape Tour, Invitation to Cocktail walks and seasonal special events, 10% discount on Manitoga merchandise, opportunity to enroll in members only Summer Nature & Design Camp (ages 5-12). • Neutra Silverlake Museum [US]: Free admission to the museum. • Casa Curutchet [Argentina]: Special price ticket $10. • Casa del Puente [Argentina]: Reduced fee in the ticket and possibility of attending special activities. • Museo Estudio Diego Rivera y Frida Kahlo [Mexico]: Specialized tours in the museum. • Cultura Chacao [Venezuela]: Two tickets to the architectural, touristic or culinary tours and two tickets to the plays presented in the Sala Cabrujas or in the Centro Cultural of Cultura Chacao. • Bauhaus Center Tel Aviv [Israel]: 20% off in publications, in the Center and online. • National Museum of Western Art [Japan]: Free admission to the Permanent Collection. Check Docomomo chapters pages for more information on agenda. Docomomo International members are welcomed to attend all the events. To have your membership for 2019 Register Online with the Secure Server System or send us a cheque for the required amount made out to Docomomo Australia Incorporated, to the Membership Secretary/Treasurer, Docomomo Australia Incorporated, 70A Blues Point Road, North Sydney, NSW, 2060. Join DOCOMOMO Australia again in 2019 to participate in the local and international effort to discover, document and conserve architectural landscaped sites of the Modern Movement across the 20th century in Australia and worldwide. DOCOMOMO Australia is a volunteer group of architects historians, conservationists and enthusiasts who all share a desire to raise awareness, appreciation and protection of Australia’s recent designed past for the present and the future. Without a strong core of financial members, DOCOMOMO Australia cannot pursue and grow its documentation and advocacy work or continue to be recognised as a voting international working party. With the financial assistance from membership fees we can continue to build our activities and digital forum. We are looking forward to having many new members to strengthen and expand our existing expertise. We want you to help us and to enjoy being part of DOCOMOMO Australia with us.